The updated 1101D Mel-Temp Digital Melting Point Apparatus offers a quick and easy way to measure the melting points of samples at a budget price. It is ideal for multiple users, being ergonomically designed to ensure comfortable viewing for everyone, with a height-adjustable extension arm and a viewing head that may be rotated to suit each user. 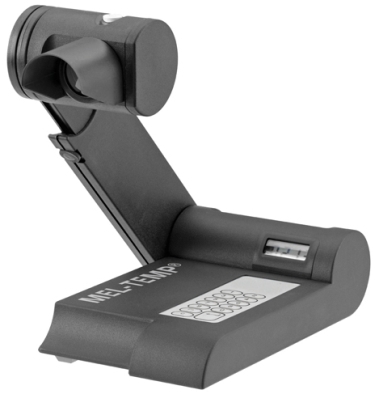 As a visual aid, the viewing head holds a viewing magnifier that offers 8x magnification. Each Digital Mel-Temp comes supplied with a complimentary pack of 50 capillary tubes, its own power supply and power cable. The 1101D Mel-Temp has power requirements of 115-120V and 50-60Hz. The 1102D Mel-Temp Digital Melting Point Apparatus has exactly the same functionality, but has power requirements of 230-240V; 50-60Hz. Units can be calibrated by the user on their site or by manufacturer/service organisation. If calibrated by the user, a calibration kit is required.